The town of Ranchester is located 9 miles south of the Montana border beneath a panoramic central view of the Bighorn Mountains. U.S. Highway 14 west of Ranchester leads to the mountains and onward to Yellowstone National Park. The county seat of Sheridan lies just 12 miles to the south. Incorporated in 1911 (over 100 years ago), Ranchester got its name from S.H. Hardin, who owned a local ranch encompassing several thousand acres. Town names in Hardin’s native England often ended in “chester,” so Hardin dubbed the town “Ranchester.” In addition to its namesake ranches, the town was the site of the loading dock for railroad ties hewn from harvested Bighorn Mountains timber and floated down the tie flume. This quiet town on the banks of the Tongue River is gaining popularity as a retirement destination. With amenities including city water, sewer and garbage services, a bank, post office (no home delivery), active community center, community library, fishing pond, state park, and a museum, Ranchester has much to offer for retirees and young families alike. 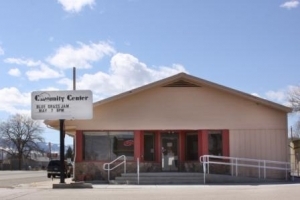 Basic essentials are available in town, and local businesses provide services and products to support the many recreational opportunities available in the nearby Bighorn Mountains. Children attend school in Ranchester from kindergarten through 8th grade, then travel to nearby Dayton throughout high school. Five churches offer a broad range of opportunities for worship. Public safety in Ranchester is maintained by the local fire department, town marshal, and the Sheridan County Sheriff’s department.